Creating healthy meals is easier when you keep your pantry and fridge stocked with healthy ingredients. This is the reason I always have yogurt, specifically Stonyfield Whole Milk Greek Yogurt, on-hand. Greek yogurt is one of those foods that can be enjoyed any time of day. It can be eaten alone or easily added to many of your favorite recipes to lighten them up. Yogurt is a great substitution for mayo, sour cream, oil and even butter. And not only is it a useful product to keep around it's also delicious. 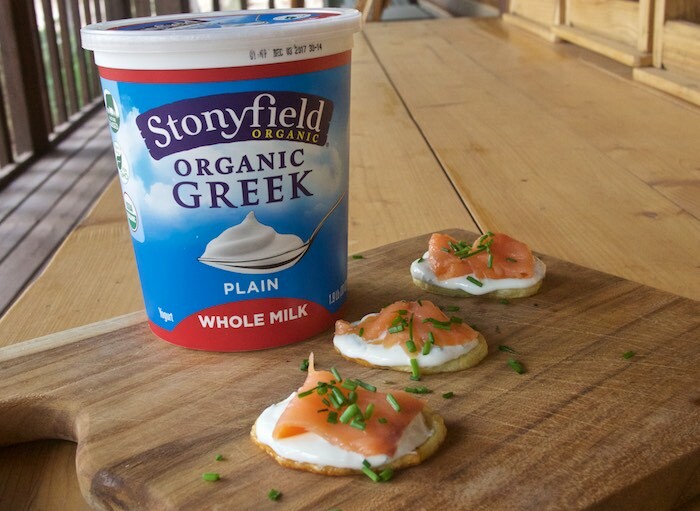 Smoked Salmon Potato Bites are made with simple ingredients one of which is Stonyfield Plain Greek Yogurt. The yogurt, in this easy to make appetizer, takes the place of cream cheese which is traditionally used with smoked salmon. Slice potatoes about ¾ “ thickness and place into a large bowl. Add olive oil, salt & pepper and toss to coat. Bake potatoes for approximately 15 minutes, flip and bake for an additional 12 minutes. Potatoes are done when they are lightly golden, and still soft....not crunchy. Allow potatoes to cool in pan while you make the topping. Mix the yogurt, lemon juice and zest together season with salt & pepper. Top each potato round with 1-2 teaspoons of yogurt sauce, a slice of salmon, and a sprinkling of chives. Mmm the hint of lemon would make that super tasty! Any excuse for smoked salmon works for me! YUM! What a great appetizer idea! So easy and healthy too! This is one of my favorite flavor combos, I make a flatbread with flavored cream cheese and smoked salmon. Delish! LOVE this idea!! Two fave foods Taters and Salmon!! 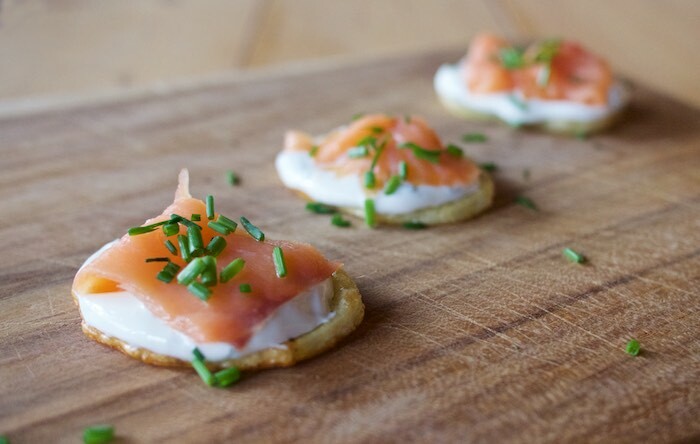 I love the idea of serving the salmon on potato "chips." This would be a great appetizer for a New Year's cocktail party. I agree with you about the yogurt - I always have plain Greek yogurt on hand - it's so versatile!